In the few months before the lights come up and the Rebel Drama shows begin, there are hundreds of hours of preparation that go into the sets, props, lighting, computer, and sound systems. 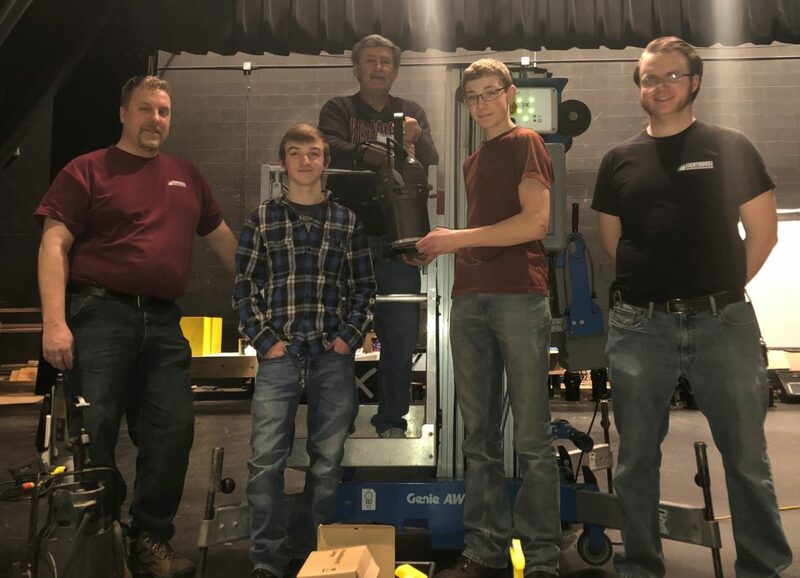 There is a special group of young artists, builders, and technical specialists that step up to make sure that our Rebel Drama productions provide the level of high-quality entertainment that our audiences have enjoyed for many years. This year’s production, ​We Will Rock You, ​provided some special challenges. The vision of the production was to provide a futuristic scenario of society underscored by the classic rock and roll music of the band Queen. Much of the set used the shades of red, blue, green, and yellow described as “Google Colors”, along with some scenes that were more drab hues that depicted the wasteland and ruins of iconic settings like the Las Vegas Hard Rock Cafe and the gates at the entrance of Graceland, in Memphis. Some of the tasks that the crew had were to construct platforms, steps, and walls that span almost forty feet across the stage and include an eight-foot rear projection screen, as the base set. Other challenges this year included building an eight by twenty-foot replica of the Graceland gates (on wheels so that it could be moved in a matter of seconds), programming and operating over a hundred stage lights, wireless microphone sound checks for every member of the cast, fog and bubble machines, and building the space on stage for a live rock band. During the run of the show, scene changes have to be quick and precise to keep the rhythm and flow of the performance moving. Set changes are made while the stage is dark, and the running crew has to work together much like a NASCAR pit crew. These changes are practiced, timed, and evaluated to become as efficient as possible while still remaining safe for the crew and cast members. OPEN AUDITIONS for the Musical WORKING! On April 22nd and 23rd at 6:00 pm, the Players will be holding open auditions for the musical WORKING. The audition will be held at Madonna Hall (1793 elm Ave., Wabeno, WI 54566). You will be doing a cold reading and will be required to sing a short song that will be taught to you at the audition. If you would like more information please contact the Players at (715) 889-1606 or email wabenoareaplayers@gmail.com. 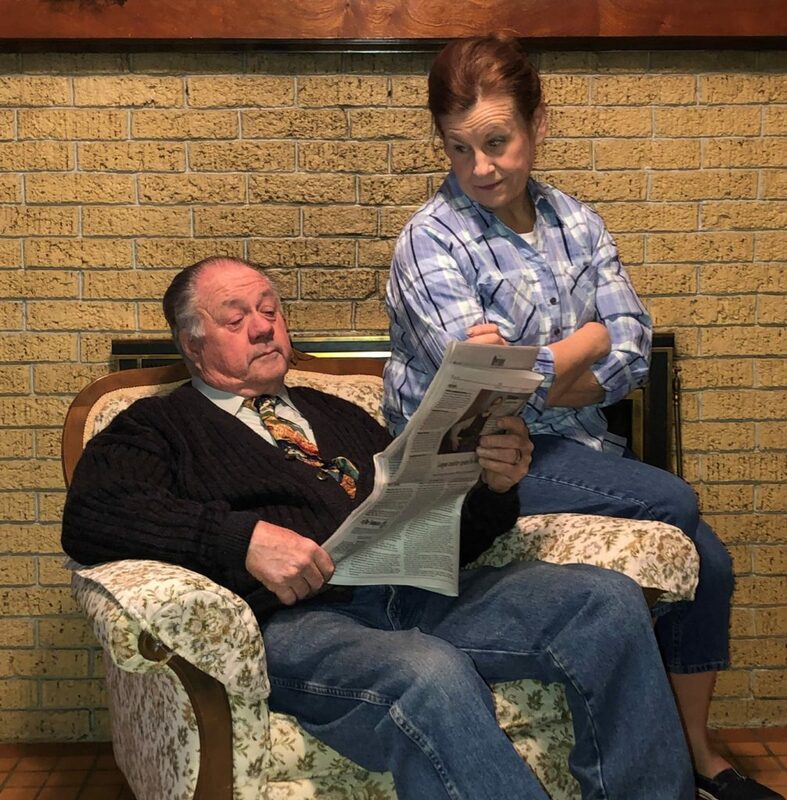 This production will be performed July 18, 19, 20, 25, 26 & 27 at 7:00pm and 21 at 1:00pm in the Nancy Volk Auditorium (Wabeno High School, 4325 Branch St., Wabeno, WI 54566). 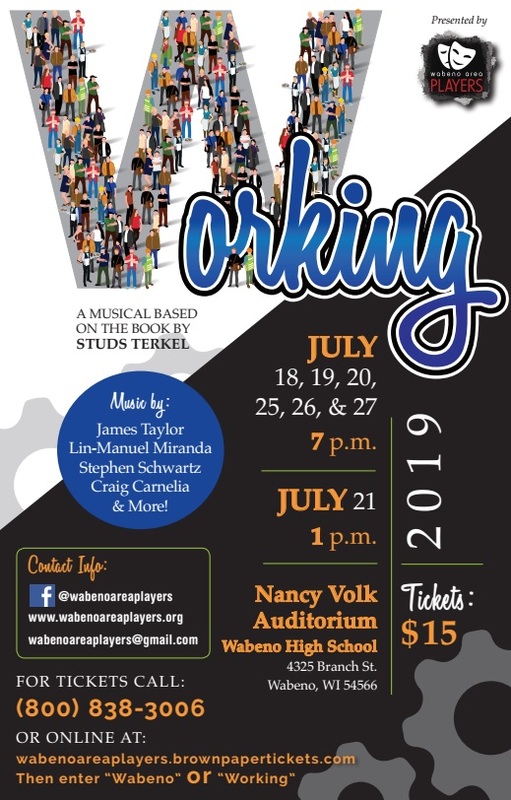 Working is the extraordinary genre-defining musical from Grammy and Academy Award-winner Stephen Schwartz (Wicked, Godspell) based on Studs Terkel’s best-selling book of interviews with the American workforce: Working: People Talk About What They Do All Day and How They Feel About What They Do. This highly original and universal portrait of the American workday is told from the perspective of those that the world so often overlooks – the schoolteacher, the millworker, the mason, the housewife, the fireman and the waitress amongst many – whose daily grind and aspirations reflect the truths of the people that make up a nation. Working employs a range of musical styles and genres from contributing composers, including five-time Grammy Award-winner James Taylor. Nominated for six Tony Awards, this classic has been updated for a modern age, featuring new songs by Tony Award-winning and Pulitzer Prize-winner Lin-Manuel Miranda. 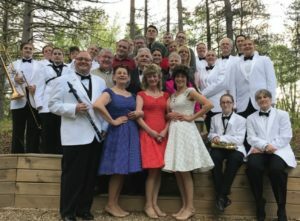 Author EditorPosted on April 12, 2019 April 12, 2019 Categories Auditions, PerformancesLeave a comment on OPEN AUDITIONS for the Musical WORKING! 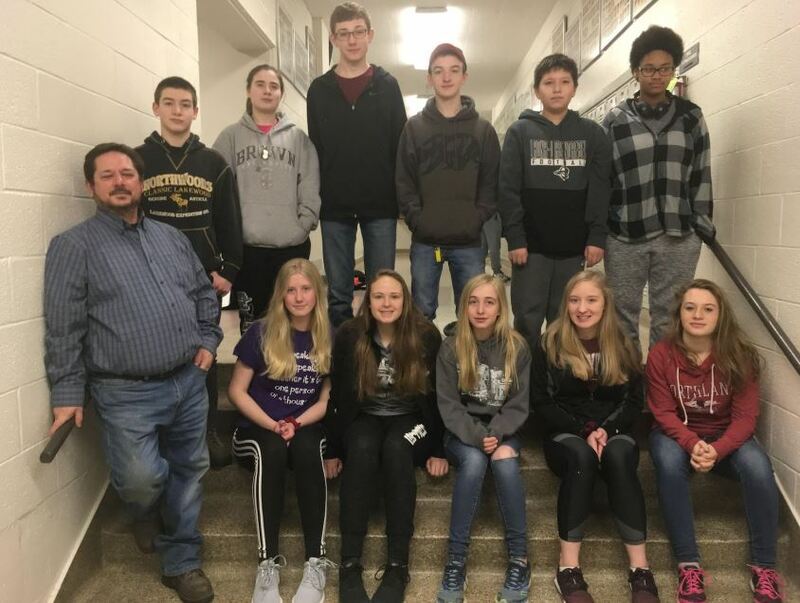 Wabeno Area Players and Wabeno High School are continuing their community and school partnership to improve the Nancy Volk Auditorium at WHS. With additions, tweaks and maintenance of the lighting and sound systems, they are working on turning the space into a state-of-the-art theatre. It is coming just in time as Rebel Drama’s March 15-17 run of Queen’s We Will Rock You is going to need to utilize every bit of tech the high school tech crew can get their hands on. 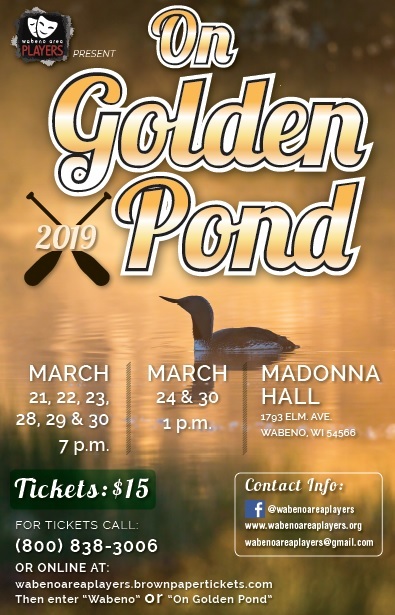 Wabeno Area Players is deep in rehearsals for their next production of On Golden Pond. This classic play and film adaptation is one production you will not want to miss. Dates of the show are March 21-23, 28-30 at 7:00pm, 24 and 30 at 1:00pm. The production will be held in Wabeno at Madonna Hall (1793) Elm Ave., Wabeno, WI 54566. The venue features table seating with beverage service at each table. For tickets call (800) 838-3006 or online at: wabenoareaplayers.brownpapertickets.com. We need you! Volunteers are needed for the following positions: Ushers, Ticket/Box Office, Table Service and Coat Check. You can volunteer for every show or just one performance. We will take any time that you have to give. Plus, you get to see one of our productions at no cost! Community theatre is made possible because of community involvement and support. 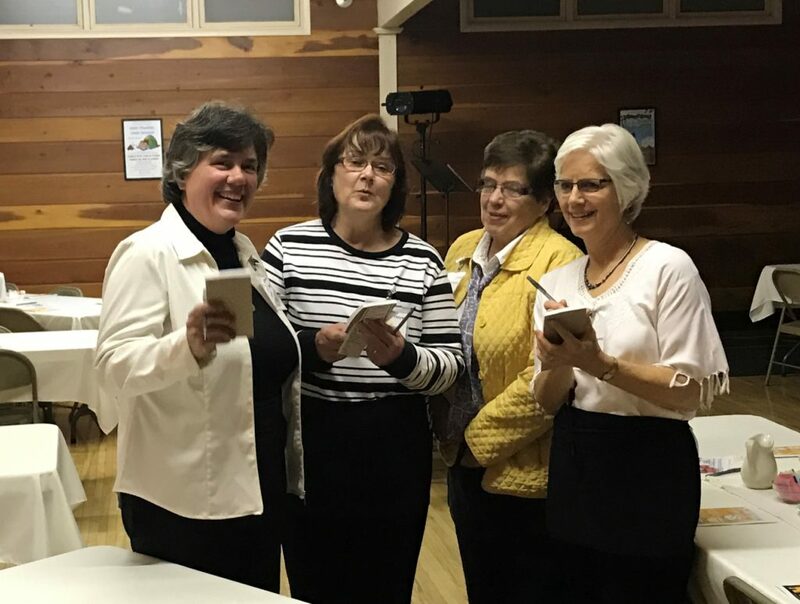 Did you know that every person you come in contact with at Wabeno Area Players is a volunteer? Our board provides necessary guidance and expertise, but to create numerous productions we need you! There are lots of volunteer opportunities: ushers, table staff, box office, marketing, publicity, stage crew, performers and technicians. Everyone is important to Wabeno Area Players. Whether it is for one hour or every day, we need you!